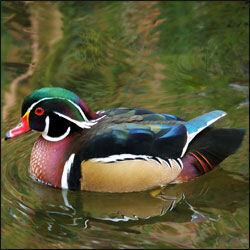 Wood Ducks are uncommon, but not rare in our region. The modern distribution is primarily along the major river valleys (Ligon 1961). Fig. 1. A male wood duck. Photograph courtesy of the U.S. National Park Service. Mid/Late Wisconsin: Dark Canyon Cave (Howard 1971. Literature. Howard 1971; Ligon 1961; Rea and Hargrave 1984.